Pen and ink and wash plan of the smaller mosque of Aurangzeb by James Prinsep (1799-1840) in 1823. 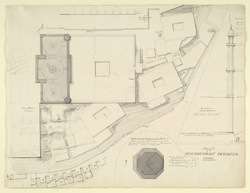 Inscribed on the front is: 'Plan of the Madhoray musjid Benares. J. Prinsep Novr. 1823' with notes and measurements. The minarets were taken down and restored under James Prinsep's direction as the foundations were giving way. The local name of Madho Rai ki Masjid is derived from the fact that the mosque is located on the site of a temple to Vishnu under the name of Bindu Madhav.